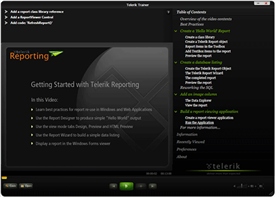 At long last, the amazing new Telerik Trainer is available for public download! If you've been following along, then you already know most of what there is to know about the tool itself. If you're just tuning-in, go back and read my complete "Telerik Trainer Sneak Preview" for all the details. With today's release of the Trainer, we're also publishing almost 30 video tutorials- the files that Trainer consumes. These packaged files include everything you need- video, code, and trainer manifests- so just download the tutorials you're interested in and load them in Trainer to get started. We'll be continually releasing new tutorials for the Trainer over the weeks and months to come, so check back often for new content. In the future, you'll be able to download new content directly from within the Trainer, but for now you can find tutorials on the Trainer download page. Be sure to download a few and start giving us your feedback (and bug reports) so we can improve this new training tool. Also, on a technical note, the Trainer download page currently requires you to log-in to your Client.net account before you can access it. This requirement will be fixed tomorrow, so we apologize for the temporary inconvenience. Other than that, enjoy the Trainer and let us know what you think!